The ‘Reggio Emilia’ approach to education originated in Northern Italy right after the end of World War II. It was created by Lorris Malaguzzi, a teacher, and parents who lived in the area around Reggio Emilia. The number of Reggio settings grew rapidly and the reputation of the alternative approach grew stronger over the years. During the last quarter century it has attracted international attention. In this post, we look at the many benefits of this approach to early years education. A key principle of the Reggio approach is the recognition that children have rights when it comes to their learning. The child is put at the centre of the practice by being treated as a ‘knowledge bearer’. By valuing children in this way educators must put more emphasis on really listening to the children. Our school fully adopts and promotes this principle: every member of staff at Alphablocks Nursery School & Pre-Prep, Hadley Wood, is expected to listen and give ample time and space to children to express themselves. Children in Reggio settings are active constructors of knowledge, who are encouraged to be ‘researchers’. Most of the educational experiences at Reggio take the form of projects, where children have opportunities to actively participate, explore, and question things. There is also a very strong emphasis on the social development of children as part of a community and their relationships to other children, their families and teachers. Our image of children no longer considers them as isolated and egocentric, does not only see them as engaged in action with objects, does not emphasise only the cognitive aspects, does not belittle feelings or what is not logical… Instead our image of the child is rich in potential, strong, powerful, competent and, most of all, connected to adults and children. So how do we adapt the key principles of this innovative approach at our nursery school? Below we provide a summary of the main practices we employ in this respect. The importance of expressive arts. This is probably the most well-known aspect of the Reggio Emilia approach. The Reggio approach starts from the premise that children use many different ways (‘one hundred languages’) to express their understanding, thoughts and creativity. This perspective has been endorsed by many artists, such as Henry Matisse, who wrote a series of essays entitled Looking at Life with the Eyes of a Child. These different ways of thinking, exploring and learning are expressed through drawing, sculpturing, music, dance and movement, painting, drama and pretend-play. Long-term projects. 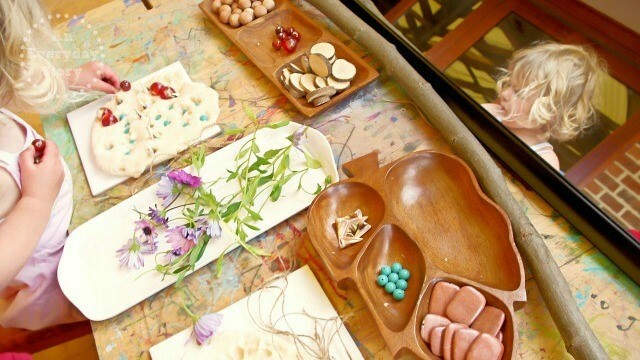 Learning projects in Reggio settings provide extensive research opportunities for young children, including real-life problem-solving among peers, opportunities for creative thinking and exploration. Children are often involved in these projects in small groups, while the rest of the class is involved in self-chosen tasks. Projects begin with teachers observing and questioning children about their topic of interest. They then introduce materials, questions, and opportunities that provoke children to further explore the topic. Projects often move in surprising directions as a result of problems that children identify. Therefore, curriculum planning and implementation revolve around open-ended and often long-term projects, which are based on a balance between teacher-directed and child-initiated activity. For instance, a project might be spurred by a child coming to school with new shoes – a potential learning journey in this case would be to find out how shoes are made, possibly also visiting a shoe-making workshop and discussing about clothes and fashion design. Tracking the individual learning journeys. 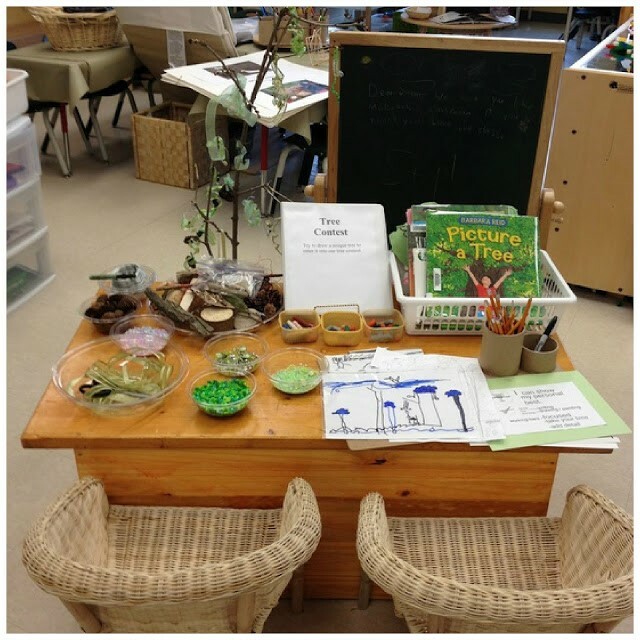 Documentation is another key element in the Reggio approach. It serves many purposes, but it is mainly used as a tool for studying children’s learning. Documentation focuses on the experiences that children are involved in and the skills they are acquiring through these experiences. The learning record is a reflection of interactions between teachers and children, amongst the children themselves, as well as children and their environment. It is a medium that help teachers assess the children’s learning and develop the curriculum from term to term. Children are given multiple opportunities to pose their own questions and problems and discuss possible directions to their learning. Our teachers at Alphablocks Nursery School & Pre-Prep, Hadley Wood, are skilled observers of children; they collect a variety of data about each child’s learning. These data points are used as the basis to analyse children’s skills and track their learning journey. Like in Reggio settings, part of this documentation is made visible in our classroom, keeping the memory of learning and a sense of ownership vivid in children’s minds. Education based on relationships. A strong network of relationships is established between the children, parents and teachers of Reggio settings to promote continuous communication between them. These key stakeholders work together to create a spirit of cooperation and co-construction of knowledge. There is a strong focus on social collaboration and working in groups, where each child is an equal participant. Parents may participate actively in the learning development of their children. In Alphablocks Nursery School & Pre-Prep, Hadley Wood, we work closely with parents in sharing and developing the children’s learning in order to ensure a consistent approach between school and home. We encourage parents to be involved as much as possible in the life of the setting by volunteering to participate in events and shadow or lead activities. We also hold parent workshops on various aspects of our curriculum and parent classes on child development. The environment is a third teacher. Good planning of the environment involves the creation of new learning spaces. In the traditional Reggio approach, in Italy and elsewhere, the classroom is generally filled with indoor plants and vines, and is awash with natural light; it opens up to a central space (the ‘piazza’), kitchens are open to view and access to the surrounding community is assured through wall-size windows and courtyards. Photographs of children’s activities and sample displays of their work, even with transcriptions of their discussions, are carefully positioned inside the classroom. There are also studio spaces in the form of a large, centrally located ‘atelier’. 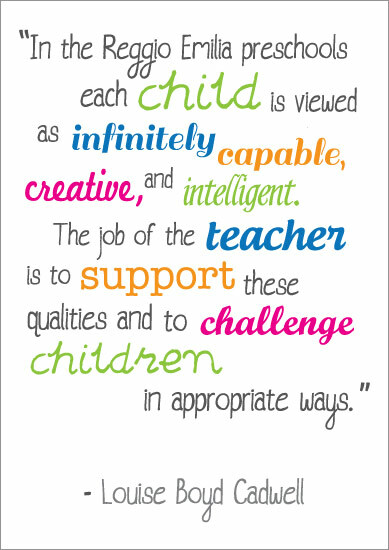 However, these are just guiding principle, and every Reggio school is unique. In addition, the school is not expected to look the same from the beginning to the end of the school year. At Alphablocks Nursery School & Pre-Prep, Hadley Wood, we make careful use of these principles to support our school’s ethos. We promote the idea that classrooms should be aesthetically capturing yet minimalist. The classroom layout and resources reflect the profile of the community which surrounds the setting. We place a very strong emphasis on natural resources and the study of the natural surroundings. We are particularly fortunate to be situated in a fantastic natural setting, surrounded by large majestic trees, at the heart of Hadley Wood in North London (we also serve Potters Bar, Cockfosters, High Barnet, Oakwood areas.) The classroom has direct access to an outstanding environment outdoors, including a sensory garden. We put a lot of emphasis on the process of choosing furniture, designing the layout and selecting the materials we use, with the aim of maximizing the children’s engagement with our learning resources. Alphablocks Nursery School • This entry was posted in Cockfosters Nursery, Early Years Education, Early Years Foundation Stage, Enfield Nursery, Hadley Wood Nursery, Pre-School Learning, Reggio Emilia and tagged child development, Cockfosters Nursery School, early learning, early years, Enfield Nursery, Hadley Wood Pre-Prep, Montessori School, nursery school, pre-school education, Reggio Emilia, Totteridge Nursery School. Bookmark the permalink.